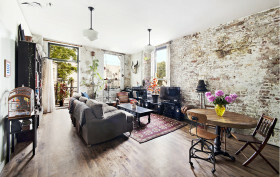 It feels rare to find a cool listing that’s under $1 million in New York City these days. But here’s a one-bedroom condo at 25 Carroll Street, in the Columbia Street Waterfront District of Brooklyn, that’s asking $850,000. You’ll find the quaint, quiet neighborhood just west of Carroll Gardens and just north of Red Hook. It’s not the easiest place to get to, as there’s no direct subway access, but the seclusion is part of its charm. There are also amazing views of lower Manhattan from here, which you can enjoy from this condo that is now on the market.